One of our early board members, Dr Allen Hall (1919-2004) received his Order of Australia medal for translation work with aboriginals, along with resurrecting traditional locality names and local histories. You can also view some of the elders we interviewed on our Origin of Races DVDs. This author has taught aboriginal children in outback Queensland, so it is only fair to say we have had a bit more experience with aboriginals than most. Let us then first deal with traditional aboriginal concepts concerning time. You don’t have to work with Australian aborigines for long to discover they have a totally different approach to the entity Europeans call time, or to what Europeans would recognise as history. Their numbering system is 1,2,3 many, so concepts such as 500 years ago, 1000 years ago, 40,000 years ago are foreign to traditional aboriginal thinking. Statements about “40,000 years” ago are ‘white fella talk’. Their simple division of history is into either now, or the dreamtime. So what do we know about the time aborigines have spent in Australia? Is there any information about where they come from, and any evidence they fit the Biblical picture of history rather than the evolutionary one? Over the past 100 years, the length of aboriginal habitation in Australia has been ‘academically’ stretched from 4,000 to 40,000 and even to 70,000 years. In the early days of European settlement, there was a semi-biblical approach to man’s history downunder, and aboriginals were regarded simply as prehistoric Stone Age people. They had no written culture, so perhaps “pre-literate” could have been a gentler term. Yet to put them in a nowadays politically incorrect biblical perspective, they weren’t Stone Age on the way up. After arriving here via Babel, where they had been city builders and famers they began to descend to a technological low. When Europeans arrived, the inhabitants were Stone Age on the way down! The date 40,000 years is usually qualified with claims such as “carbon 14 dating from Lake Mungo findings shows …”. More recent claims put these up to 70,000 years, the theoretical limit for C14, even if it was accurate! Again to remind us – no indigenous aboriginal groups have any such concept as, 30,000, 40,000 or 70,000 years. But do we have any other clues for how long have they been here? When Europeans, such as Captain Cook, began exploring Australia and the region around it in the 1700s, the explorers noticed there were millions of natives on the Indonesian islands north of Australia, yet there was a maximum of 3-4 hundred thousand original Australian’s. Those who think reproduction rates could have dropped because of the harsh environment, need to experience a little world travel. The fastest growing human populations usually occur in the worst conditions. Aboriginal population numbers alone tell us they had only been here a short time. 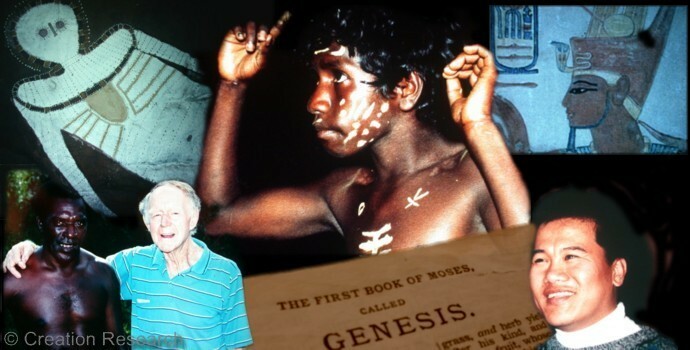 Where Did Aborigines Come From? Traditional Northern NSW Eastern Australian mythologies talk about them landing on the East coast around Evans Heads (Northern NSW) prior to splitting into 3 groups to travel North, South and West. (See the story of the three brothers, details.) their many flood stories across Australia also link them direct to a Biblical outline of History, rather than any evolutionary one. Like the 1700’s Europeans, the 1970’s Vietnamese and recent Middle-eastern arrivals, the aborigines are originally boat people. First from the Ark, then via India, then in dribs and drabs at least three or four times to Australia via land bridges and canoes. So, how long have they been here? Why don’t you ask how long it takes for three to four separate groups to produce 3-4 hundred thousand people? A long way short of 70,000 years. In fact, a long way short of 6,000 years. In fact 2,000 years would do it. The aboriginals of Australia have not been down under for 40,000 years, and have been here way less than 4000 years, and thus there is not the slightest evidence their inhabitancy of Australia contradicts the Bible. However, their Stone Age state, along with their flood and creation stories, etc. 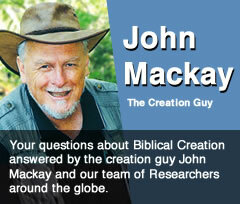 provide ample evidence consistent with the Biblical accounts of man. Aboriginals are not a group evolving up from the Stone Age at all, and like all other racial groups – black, white or in between – their first need is to deal with the problem they inherited from theirs and our common ancestors, Adam and Noah. This is not a lack of land rights or political privilege. They and we first need a Saviour from sin and Jesus has come that all those who repent and believe may be saved!